When I decided to focus my work on fashion illustration, I didn't know that I would find so many clients in the region around Stuttgart. One might think that to work in the fashion sector you have to go to Hamburg, Berlin or Munich. But fortunately the southwest of Germany is home to a quite a few stylish brands. Some produce clothes, others market them. Like the Outlet City Metzingen. They are sponsors of the artists' platform Kunscht, which celebrated a vernissage in Stuttgart last July 28th, at the Alte Kanzlei. 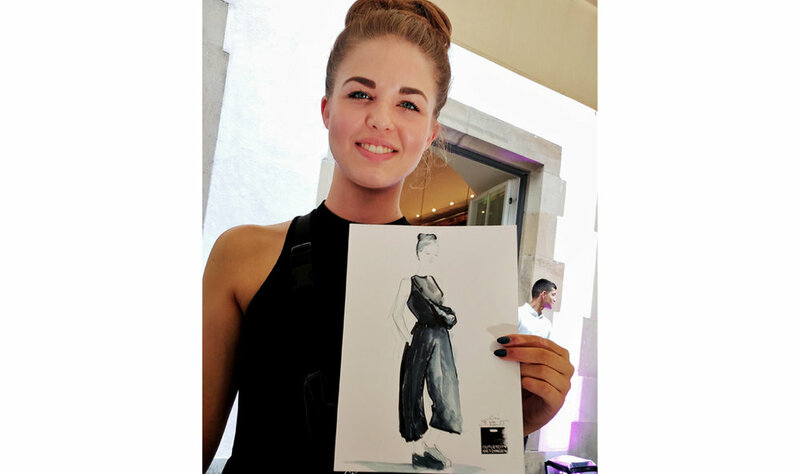 And they contacted me to entertain their guests with my fashion sketches. It was a party with a big "P": not only because at the vernissage there were a lot of guests, music, drink and good mood. That Saturday was one of the days when the city celebrated Christopher Street Day and the whole area around our terrace was a coming and going of people, costumes, more music... For those of you who are reading this and considering dedicating themselves to drawing live at events: friends, practice drawing under adverse conditions of concentration. However, a lot of good vibes and very nice people. Proof: this video. Always at the beginning of these events I have to explain to the first guests what is that I do and actively invite them to pose for a drawing. But as the rest of the guests see what it's all about, they start to form a queue of people waiting for their turn. This case was no different. We had to extend the session to one hour more than what we had planned and even so I had to console the last ones because there was no more time left. Thank you so much to all of you, dear spontaneous models, for your patience and for letting me post your photos here. The Outlet City Metzingen and I will repeat with a new event very soon. I hope to be able to draw on that occasion those who had to leave without their sketch. 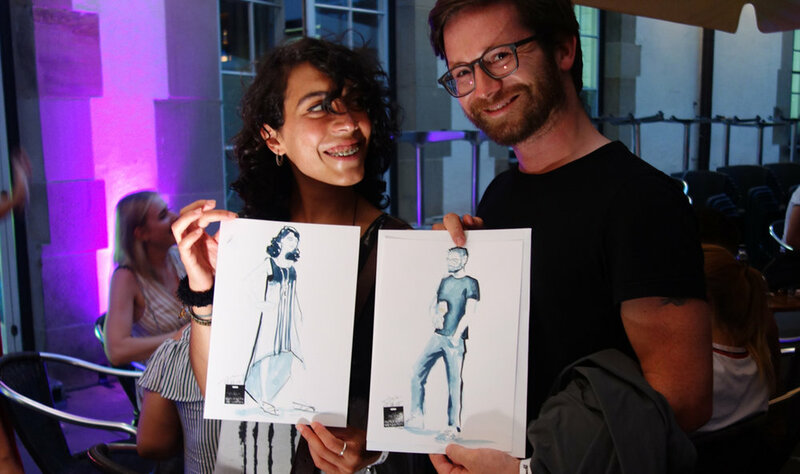 If you are planning an event too and would like me to draw your guests or to develop with you another idea to entertain them and create special souvenirs for them with my drawings, don’t hesitate to contact me and we can talk about it.